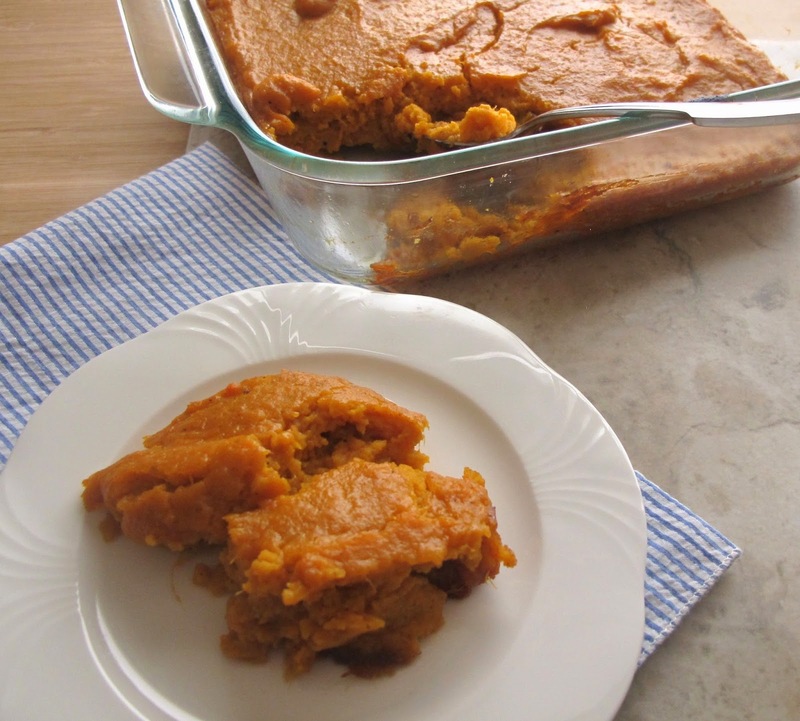 Sweet potatoes or yams can be used, perfect with roast chicken or alone as a vegetarian option. I will definitely use this for many fall dishes but wonderful anytime! Make sure your spices are fresh as they do deteriorate after a few months. Drain and transfer to a large bowl and add butter. Beat potatoes and butter with electric mixer until smooth. Add sugar, cardamom, egg, and salt and pepper; beat to blend. Bake sweet potatoes until beginning to brown around the edges and slightly puffed, about 25 minutes. Note: This can be made a day ahead before baking; cover and chill, then bring to room temp before continuing. Burgers and dogs are cooking on the grill this weekend, served with fries on the side. To enhance the baked fries, top with bacon, cheese, and grilled onions. In a saute pan cook bacon until crisp, remove with a slotted spoon and set aside. Add onions to pan and saute until softened. Remove from pan with slotted spoon. Deep fry or bake french fries according to package directions. 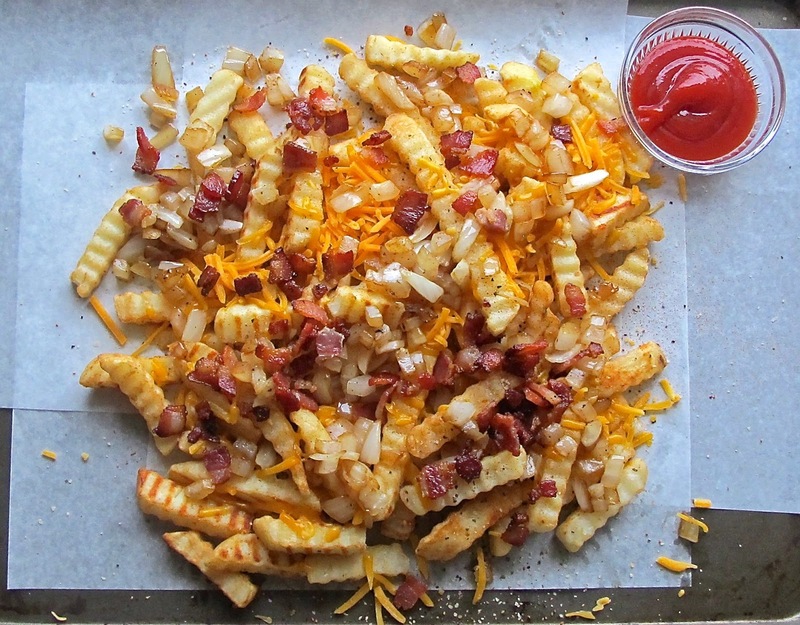 Remove from oven and while fries are still hot, sprinkle with seasoning and cheddar cheese; top with onions and bacon. This sauce is quick and easy to put together, would also be pair well with grilled beef or chicken. A note on the chipotle in adobo sauce, I love using this condiment. It is smokey and a little spicy, perfect to use in a barbecue sauce. Chipotle peppers are smoked, dried peppers, usually jalapeno, and come in a can. The problem is you rarely need the whole can. If I know I am using them in the near future, I leave the leftover peppers and sauce in a sealed glass container in the fridge. Otherwise, you can make a paste by blending them in a food processor and freezing them in 1 Tablespoon amounts to use when needed. In a small bowl, combine mustard, honey, and garlic. Place pork in a glass pan and cover it with marinade. Allow it marinate in fridge for several hours. About 20 minutes before cooking, take pork tenderloin out of fridge and bring to room temperature. Place pork on foil lined baking sheet and cook until internal temperature reaches 145F. Remove and allow to rest while making sauce. In a food processor mix plums, chipotle, honey, and salt until pureed. Transfer to a small saucepan and heat to boiling. Remove from heat. 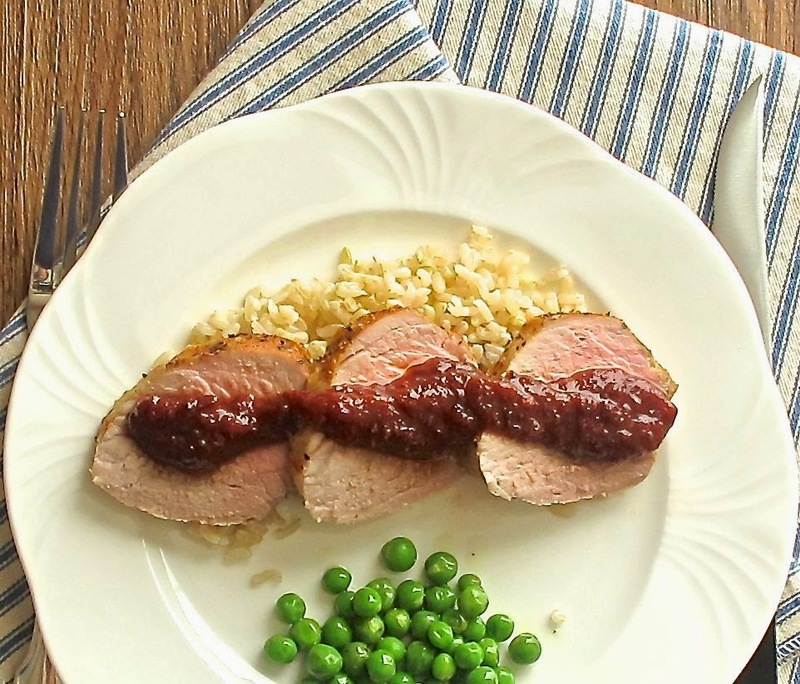 Slice pork tenderloin and spoon sauce over top. 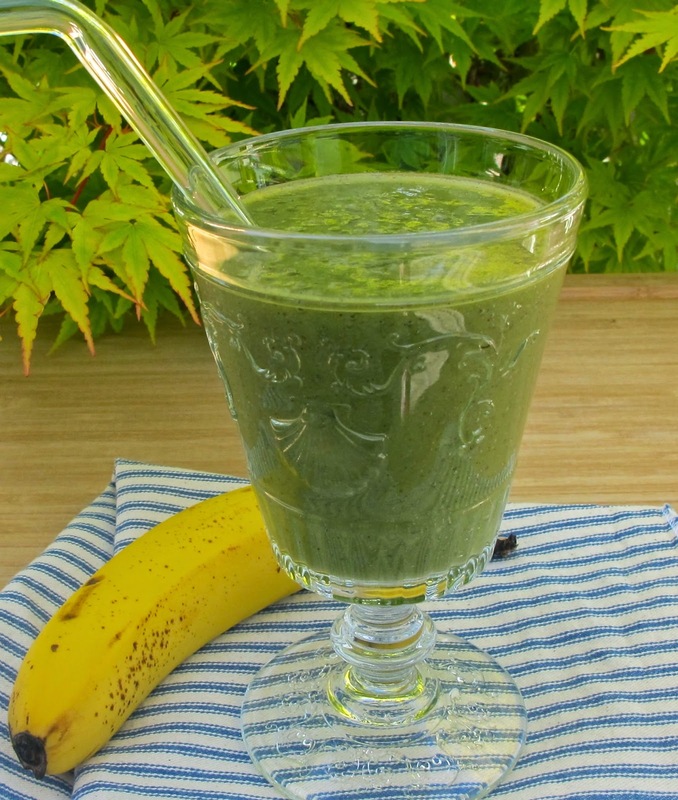 This is Bakes latest, favorite green smoothie. He loves peanut butter and banana sandwiches, so maybe a nut butter would be a good addition to this smoothie in the future. In a strong blender (like Vitamix) combine coconut milk, bananas, greens, kiwi, honey and ice. Blend by starting slowly to mix and then turn up speed to blend well. Maryellen prepared a wonderful dinner, under the stars, in her beautiful backyard for the neighborhood "train" girls. Maryellen is always very thoughtful in what she prepares for every ones needs. I usually skip dessert to avoid gluten, but on this evening she made flour less chocolate brownies. They were a hit with all the gals. 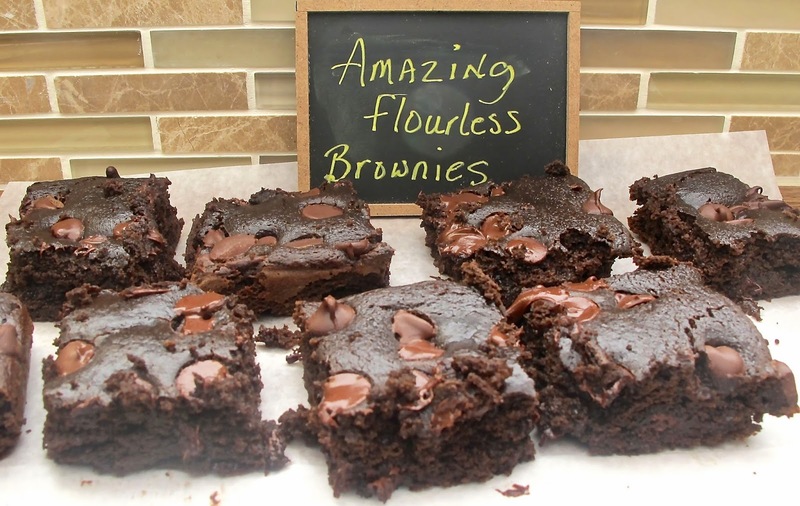 The brownies were low in fat, moist, and most of all chocolaty and flavorful! She asked if we could guess the main ingredient, but we couldn't. Seriously, I thought these were loaded with butter! I was thinking in the future of trying a cocoa powder that had a chipotle spice. I used coconut milk in place of the almond milk and because I was giving this to the wee ones, I used decaf coffee instead of the fresh ground coffee. Grease a 9x9 inch square baking pan and line with parchment paper, leaving a 2 inch overhang on all sides. In a food processor or blender combine, beans, eggs, cocoa powder, oil, almond milk, vinegar, baking soda, baking powder and coffee and blend until smooth. Place the mixture in a small bowl and fold in 1/2 cup of chocolate chips. Pour the brownie batter into prepared pan and sprinkle top with remaining chocolate chips. Bake the brownies until a toothpick comes out clean, about 30 minutes. Allow brownies to cool completely before cutting them into squares. I had anticipated making a potato soup with bacon and chives for lunch, but while working in the garden, I pulled up a few leeks. 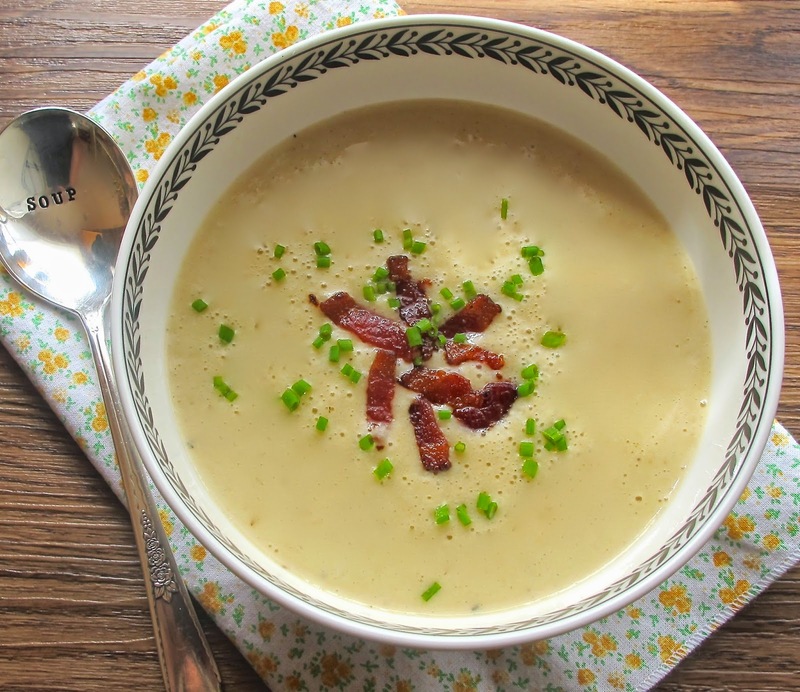 So, we ended up with Potato Bacon Leek soup! In a soup pan or dutch oven over medium high heat, cook bacon until fat is rendered. Remove bacon with a slotted spoon and reserve. Add leeks to bacon fat and saute until leeks have softened. Add potatoes and stir well. Add shallot, garlic, seasoning and thyme, stirring the bottom of pan to loosen brown bits. Add stock and bring to a boil, lower heat and simmer until potatoes are softened, about 15-20 minutes. Turn off heat and add cream. Blend soup using a blender or immersion blender. Check for seasoning and add salt and pepper, if needed. Serve in bowls and top with reserved bacon and chives. 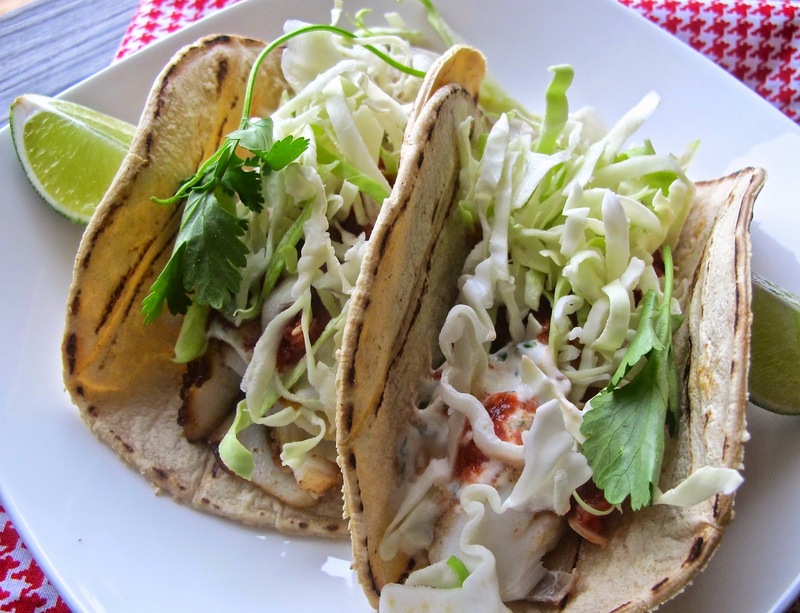 So many ways to make fish tacos. The Bake likes them deep fried but they are just as good cooked on the grill. A firm white fish is best, I used Cod but Halibut, Snapper, or Mahi Mahi would also work. Winter salsa, (from previous post) or your favorite Pico de Gallo served along with cream sauce. In a small bowl, combine sour cream, mayo, cilantro, zest and lime juice, adobo sauce, garlic and salt. Whisk and set aside in refrigerator for several hours to allow flavors to meld. Place fish in a glass dish. In a small bowl combine chili powder, cumin, garlic, salt, pepper, and olive oil. Pour over fish and coat well. Allow to marinate in the refrigerator (about 4 hours). Turn grill to medium-high and cook fish about 3-4 minutes a side. Remove from grill and place on a platter, cut into chunks. While fish is grilling, put foil wrapped tortillas on the other side of grill to heat. To serve tacos, take a warm tortilla and top with pieces of fish, a spoonful of lime-cilantro sauce, a spoonful of salsa, and some cabbage. Garnish with lime wedges and cilantro sprigs. 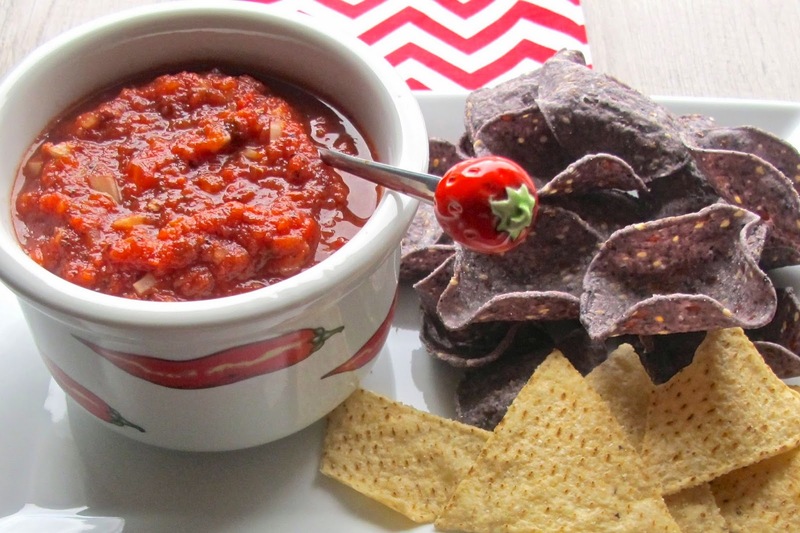 Trying to find salsa for your Cinco de Mayo fixins? Are the tomatoes in your local not quite ready? Or, if it is the middle of winter and tomatoes are out of season, this salsa comes to the rescue. It is a hot, smoky, salsa due to the addition of chipotle sauce. I am already thinking this will be topped on a frittata or omelet for breakfast. In a food processor, pulse the tomatoes and chipotle peppers with sauce, to combine but still chunky. Put the salsa in a small saucepan and add the onion and oregano. Simmer for about 10 minutes to meld flavors, add salt if needed. OK, so we are back to kale again, love these salads, and the many varieties of kale and toppings to combine them with. After we had the salad I thought the addition of toasted nuts would make this salad even better. 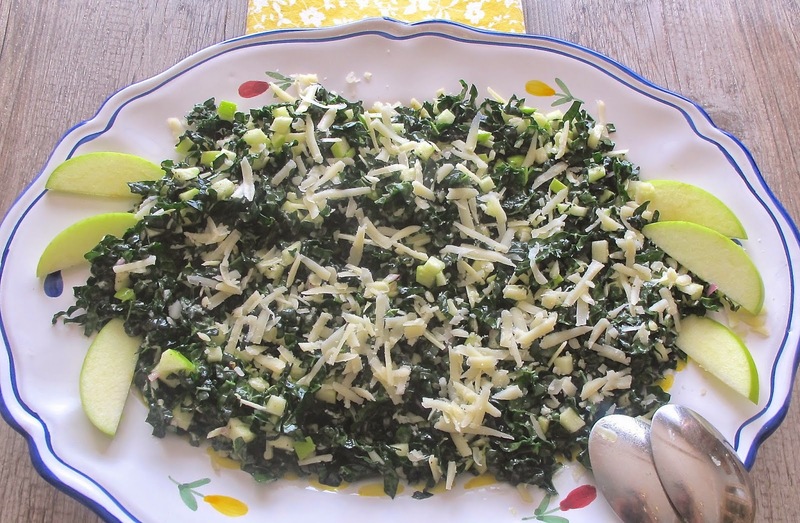 Chop kale into thinly sliced ribbons and put in a salad bowl. Add 1 teaspoon olive oil and pinch of salt and massage it into kale. To make dressing, combine shallot, 1 Tablespoon olive oil, lemon juice, apple cider vinegar, and honey in a small bowl. Add apple to kale and toss with salad dressing. Add most of cheese, sprinkle with salt and pepper and toss again; check seasonings. Top with remaining cheese and serve.